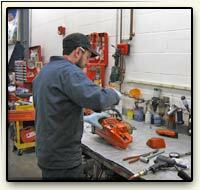 Morrison's Power Equipment service department prides itself in doing top quality work at a fair price. We do many things to accomplish this goal. First, all our technicians are O.P.E. 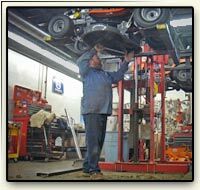 certified, as well as attend service schools regularly to keep up to date with the latest repair procedures and techniques. Second, we are constantly adding new tools and equipment to keep our facility running at peak efficiency, which means your repairs, are done on time and as economically as possible. Third, Our computerized parts inventory is well stocked to eliminate waiting and if we don't have a part to complete your repair, we order daily, not weekly, so we can get you up and running quickly. Fourth, we warranty our repairs for 90 days against defects in materials and workmanship. So in the rare occasion we do make a mistake, we are going to fix the problem right away, not try to avoid it and hope it goes away. Morrison's History - A family business started by brothers Scott and Walter Morrison III. in 1972. After seven years at their original location in Sandwich MA Scott started the power equipment sales and services division in 1979. In 1982 the brothers opened their current Plymouth MA store location. In 2006 Scott built his state of the art sales and service center next door to the home and garden center. This measuring 10,000 square feet housing a 3500sq foot showroom, 2800sq foot service center, and 2000sq foot warehouse making Morrison’s Power Equipment one of the largest on the south shore. Despite this size, Scott has never forgotten the kind of specialized customer service that has allowed his business to flourish for over 30 years.